When I was looking for a different side dish to put on our holiday table this year, I came across the herb-roasted cauliflower that I posted last week. 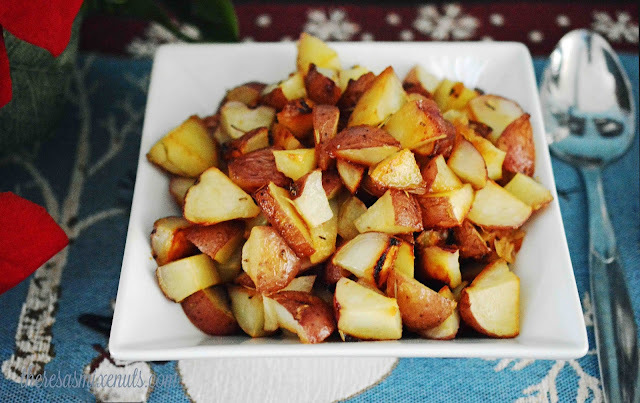 I also happened to notice this Roasted Potatoes recipe on Golden Blossom Honey and thought, "What the heck! Why not try 2 new side dish recipes this Christmas?" Jason had a rare weekday off earlier this week, and since we didn't have time to go out to lunch, we did a trial run on the potatoes for our afternoon meal. These potatoes are super easy to prepare, and have the perfect blend of ingredients that make them so flavorful, you'll want to make them year round! We'll definitely be making these potatoes often, even after the holidays are over! Have you finalized your holiday dinner menu yet? Honey on potatoes? Very interesting! I'm going to my aunt's house for Christmas so I don't have to plan a menu...yay! It's the opposite for us. We love potatoes here. Even the picky ones who choose pop tarts over home cooked food will eat them. I have never used honey on my potatoes before, but it sounds awesome. I need to try these. 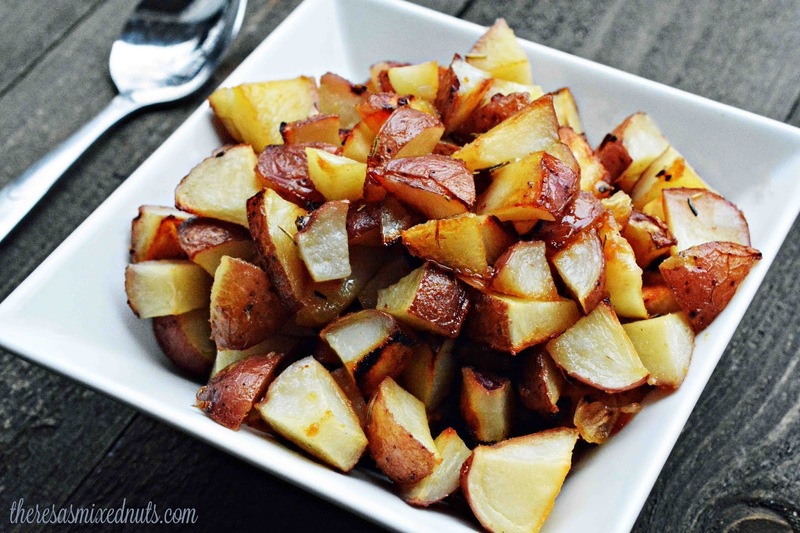 I love roasted potatoes and make them often. Next time I am going to try the honey on them. I love roasted potatoes. This looks like a delicious recipe for them. These potatoes do look good. My Mom makes Chili and a Cheesy Potato Soup. Then we have cheeses, crackers, shrimp, veggies, fruit... I always bring a few types of cheese balls. I still have to figure out what I'm bringing to the Christmas day function. It's ALL my mom's family. We all bring a few different things. It sounds like a lot of great food is getting served at your family gatherings! These do sound really good. Roasted potatoes are really comforting on a cold day. Can't I be one of those terrible people who create a demand for McDonalds on Christmas? Seriously I can't stand to see anyone work on Christmas who doesn't have to. I typically avoid any place I see open on it. I wouldn't want to work on Christmas, so I'm not going to let others do it either. I agree. I hate that the theaters are open. I heard a few people talk about going to see the new Star Wars movie on Christmas with their family and rolled my eyes thinking that maybe those cinema employees would like to be spending time with their family, too! This looks yummy. I've never tried adding honey into my roasted potatoes. I have to try this. I am a fan of any food with potato. I will definitely try this new recipe. Glad you shared it. Those look delicious. I never thought of adding honey to something like this, but what an awesome idea. I love roasted potatoes. They are always a favorite in our house. This year i am not cooking Christmas dinner. I am definitely going to try this recipe. I have personally never roasted potatoes and I've never thought of using honey either. I'm going to have to give this a try. Roasted potatoes are one of my favorite meals. They taste so great within so many recipes. Oh yum - love potato recipes. Will be trying this one soon, however we already have our menu set, and mashed potatoes are a must - along with spiral ham, broccoli casserole, corn pudding, strawberry pretzel salad, rolls and peas. For dessert I'm trying this turtle cake that is floating around Facebook, and my mom always brings some tasty goodies!! Yum! !